The TOFT trade stand at Olympia for the Spring Knitting and Stitching show this weekend. All the ladies of TOFT are there until Sunday manning not only the TOFT trade stand but also hosting crochet lessons in the jungle. Yes the jungle...a TOFT project in support of the Birmingham Children's Hospital which has been created by Kerry and her posse alongside all the dedicated volunteers at TOFT over the past eight Sundays. Well done one and all for a monumental effort! These bad boys are obviously impressed and I'm not surprised. The jungle is huge, very green, extremely impressive. 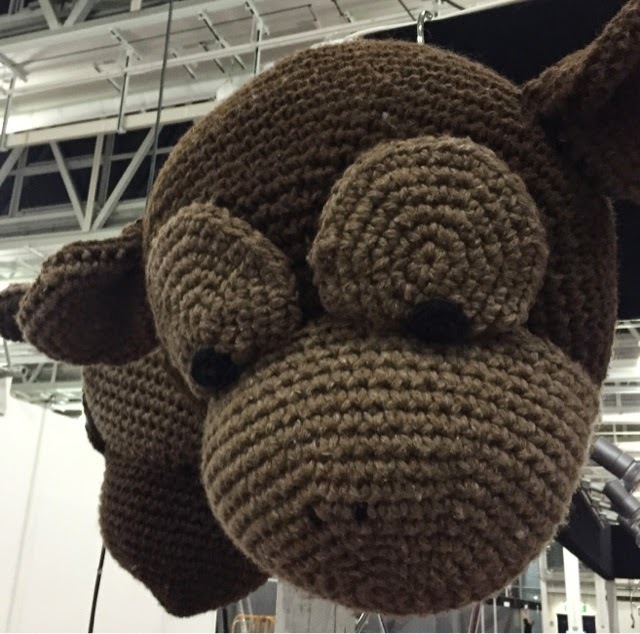 It is adorned with miles and miles of crocheted vines and more monkeys than you can shake a stick at. Visitors can sit in it and add to their environment over the next four days. Interactive crochet???? Have fun ladies I'm sure the jungle will be a real wow. Meanwhile the rest of the. TOFT alpaca experience will obe up in Telford with the TOFT Alpaca show team. Never a dull day at TOFT ...'twas ever thus!!! Perfick! Congratulations to all who helped Kerry make this project a reality and more pics to follow once the jungle is officially opened this morning.